A BBC survey aimed at finding out which Scottish football clubs backed strict liability in the wake of an increase in misconduct in the stands. However, just three clubs out of the 42 league sides in Scotland threw their weight behind the measure in the poll carried out by BBC Sport. 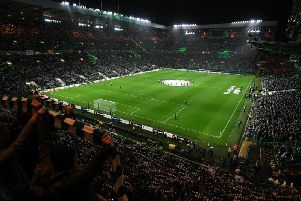 Strict liability, used by UEFA in European competitions, sees teams punished for the actions or conduct of its fans, regardless of whether the club is at fault. An example would be partial stadium closures over racist chanting, or fines for offensive banners or pyrotechnic use. Why is it being discussed? A steep rise in incidents in Scottish matches over the last six months - throwing of missiles, sectarian chanting, seats being thrown at rival supporters, fans entering the field of play in celebration, and to confront players plus use of pyrotechnic devices has led to club chiefs calling for action to be taken. In the aftermath of Hibs’ 1-1 draw with Rangers earlier this month, which saw a fan leave the home support and confront Light Blues captain James Tavernier on the pitch, chief executive Leeann Dempster said “nothing was off the table” in terms of a response to curb the misbehaviour. Clarifying her comments days later, she said: “For the record, I did not “suggest” the closure of the East Stand, as has been claimed. “When we should have been talking about an exciting game and a performance of real character by our team, we have instead spent our time discussing the loutish behaviour of individuals who seem determined to ruin football for all of us. “It has to stop and we need your help to make Easter Road Stadium the vibrant, noisy, colourful, exhilarating but safe, welcoming and tolerant place it normally is. The BBC contacted each of the 42 SPFL clubs to seek their views on strict liability - but just three clubs backed the move: Championship pair Partick Thistle and Queen of the South, and League Two side Annan Athletic. Fourteen clubs confirmed their opposition to the measure but 25 clubs, including ten of the 12 Scottish Premiership sides, refused to comment, or didn’t respond. How did your club respond? Eight SPFL clubs neglected to respond to the survey, including Celtic, Rangers and Hearts. A total of 17 clubs didn’t wish to make any comment.